There is so much news to share! This new year has brought inspiration and energy to all things creative. + I've turned my design studio into a shop by appointment store. Thanks to all of the people that have already come in to peruse and buy! The studio store is now stocked with new items not available on the website-- camis, tops, dresses, and accessories with beautiful trims and finishings. Please email or call by clicking here to make an appointment, this is great way to try items on for size. Treat yourself to cookies, coffee, and personal shopping! Times are flexible to your schedule. + JillAikoYee items are now on etsy. The All Flowers Scarf was selected to headline the Daily Candy Valentine's Day Crush List, and since then the etsy 'favorites' love has been rolling in! Thanks to friend and customer Suchin Pak for the wonderful feature. + Co-Lab Project is underway! Come see the first in a series of design collaborations on the jillaikoyee store! 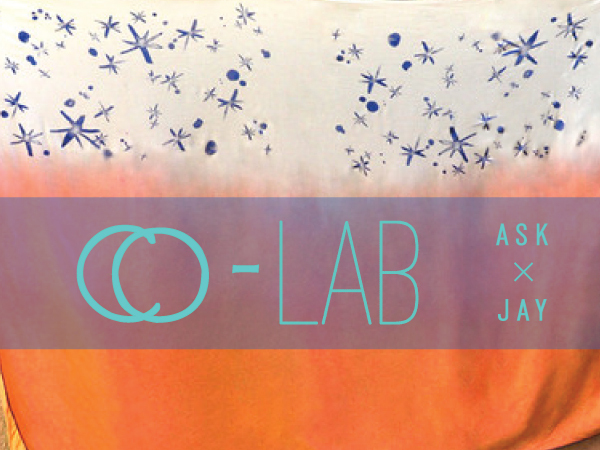 Co-Lab is my way of joining talent with other creatives to make Limited Edition Designs in an experimental way. The first collaboration was with Amy Sue Kim, graphic designer and water color artist. We printed and dip dyed, the result is a deliciously soft, all cotton scarf you won't want to take off! Tangerine is the color for spring, it will brighten your mood and freshen your wardrobe, so c'mon and take a look. +Friend and customer Maryanna Donnely asked me to speak to her 6th grade art classes about design for an afternoon. It was a joy, and her students were attentive and enthusiastic with many questions. I've always wanted to get involved, and i hope this will be the beginning of many more classroom visits. Please stay tuned for details about the Book and Art supply Donation Party we'll be throwing in March for Maryanna and her students.